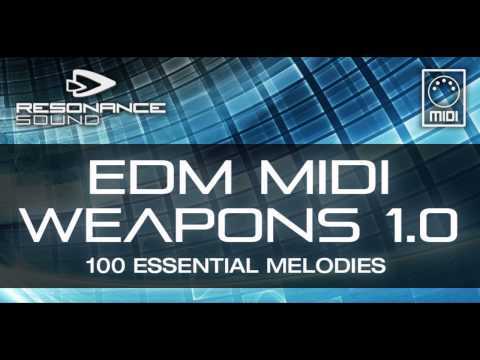 Welcome to the mighty EDM MIDI WEAPONS – Bundle distributed by Resonance Sound. Your chance to get 300 superb MIDI files for EDM, Electro & Progressive House and Trance – a massive arsenal of inspiration and ready-to-use melodies with basses, leads, chord progressions, plucks and pad melodies. Tags: Deep House, EDM, Electro House, House, MIDI, Progressive House, Trance. 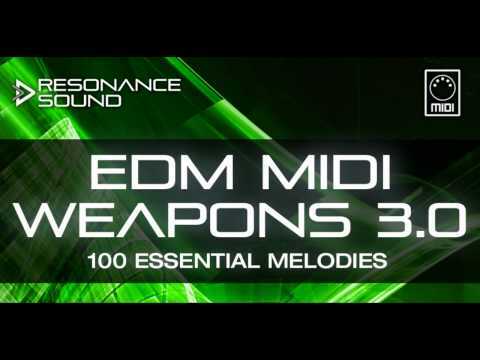 Welcome to the mighty EDM MIDI WEAPONS – Bundle distributed by Resonance Sound. Your chance to get 300 superb MIDI files for EDM, Electro & Progressive House and Trance – a massive arsenal of inspiration and ready-to-use melodies with basses, leads, chord progressions, plucks and pad melodies. All royalty free files are key-labeled to make choosing the right file even easier and properly sorted. Sometimes the most striking weapons are just too tiny to be seen: EDM MIDI Weapons 1.0 delivers very few kilobytes of data, but at the same time a huge armory of 100 MIDIs covering everything from arps to basses, leads, chords or pads – simply the perfect starting point for your next EDM production! No matter whether you’re looking for a tiny little background arpeggio, some hammering straight bassline, rich and harmonic pads or some plucked rhythm – it’s just too simple and inspiring to throw one of these MIDIs of Resonance Sound at your synthesizer of choice and watch it enjoy some fresh bits’n’bytes. Lock’n’load! How about composing the next edm hit single of yours alongside exploring your new musical toy? Resonance Sound got ready just in time to provide you with the successor of the highly demanded ‘MIDI Weapons’ series: EDM MIDI Weapons 2.0! This superb package is serious about getting some instant groove, inspiring lead themes, thrilling plucks and basslines or sweet pad sound out of any synthesizer you can imagine! Royalty-free, properly sorted and labeled you’re ready to go with 100 MIDI files perfectly suitable for the dancefloor. Get on with it and create your next electro & progressive house club smasher! EDM Midi Weapons 2.0 is essential to enrich your productions Electro, Progressive House and Trance, thanks to the flexibility of MIDI files, you can search for the perfect sound content using your favorite Vst to shape your productions, all of course Royalty-Free.